Sunday morning I picked Christian up a little after 5:30 in the morning. We drove up to Target where we met Stuart, who we carpooled with to Gap Creek, off Chrisman Hollow Road in the Massanuttens. There we met up with fellow CAT Runners AJW, Sophie, and Marc and somewhere on the order of 40 members and friends of the Virginia Happy Trails Running Club. 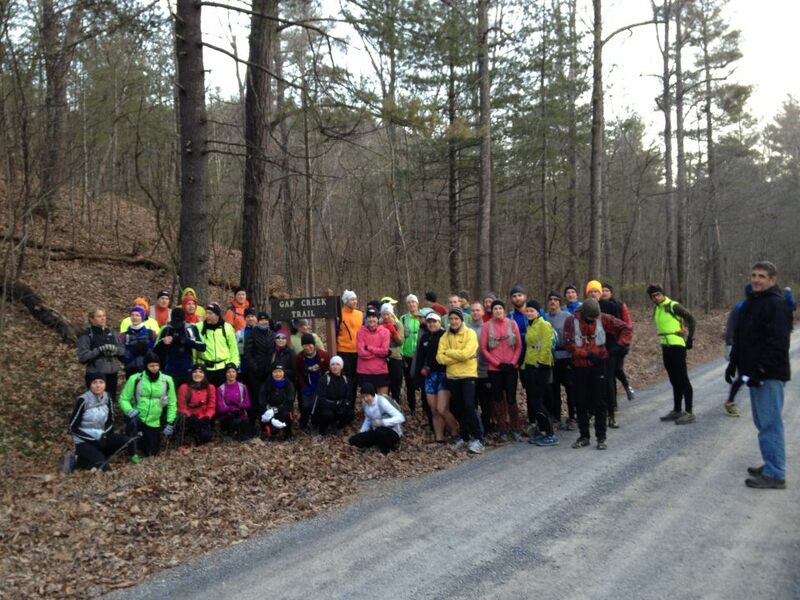 We were all gathered there for the Gap to Gap run, a marathon-distance training run for the Massanutten Mountain Trails 100 miler, which the VHTRC hosts. Since I’m boring and all text, here’s some pictures from one of the other runners. Rumor has it that the temperature when we started was 14℉, and I’m inclined to believe that. We started in a bit of a valley, and the sun hadn’t reached us yet, so I was pretty happy to start the run off with a climb up to a ridge. Throughout the day, my temperature-related comfort was a function of which side of the ridge I was on – out of the sun and windy (holding my ears to try to keep them warm), or in the sun and calm (ah, nice). I started near Christian and Marc, but I think they must have been more bundled up than I was, because they apparently weren’t in quite as much of a hurry to get into the direct sunlight. By the top of the ridge, I found myself running with Keith Knipling, with only two folks ahead of us. AJW wasn’t far behind – just far enough to have stopped to take off a jacket. I spent the next nearly 5 hours running along with Keith, not seeing any other runners (until the end as we caught people who had done an abbreviated loop) throughout the course of the day. Keith has run the MMT100 13 times now, so he knows the trails and was telling me tidbits about them and various variations of the course throughout the years as we ran. It was great not having to rely on a turn sheet, and I hope Keith wasn’t too bothered running with me. As we got close to the first aid station, he made a comment about how he wasn’t really going to stop for long, and I said that sounded fine. And then I asked if he was hoping I’d stay long so he could put some distance on me, but he said no. It should be noted that he’d run a 50k the day before, and that’s the only reason I was able to keep up with him all day. Also, speaking of aid stations, holy cow! The VHTRC is awesome! For this run, which was completely free, we had three aid stations with a delightful crew at each one. And the food! Chocolate covered bacon, homemade cookies, chocolate covered peanut butter balls, peanut butter filled pretzel nuggets, and more usual chips and snacks and drinks (and some less usual (for non-VHTRC event) aid station drinks – high proof! ), … At the end (with a campfire!) we had homemade chili, Brunswick stew (thanks Sophie! ), some sort of delicious turkey meatballs (made by the personal chef of Joe Biden), and still more chips and cookies and drinks. So, maybe I run to eat – at least I’ve got a reason. Finally, a little tip I finally realized on this run: You can easily use your own body heat to prevent water pack tubes from freezing up. I’ve got one of the Nathan packs and on cold days the valve you bite on, and even the tube running to the bladder, can freeze up. About an hour in to the run Sunday, I decided to try tucking the tube down the front of my shirt, and in short order water was passing through without issue. After basically chewing my first Gu of the day, I decided to try something similar and tuck one into my glove for a few minutes before eating it, with similar success. Pictures by Charlie Miracle. Created with Admarket’s flickrSLiDR. ← Re:New Years Resolution Rendevous Run! VHTRC is the best. Are you running MMT 100? It will be warmer, in May. Nice report Nick! Sounds like it was a great day. These VHTRC folks rock! Nick, great report! I am so glad to hear you had a good run and an awesome start to 2012! P.s. come visit Oregon for a race!